On Tuesday we discussed the idea of finishing well and how we can model that for our children. Today we will cover some strategies for training our children to finish well. 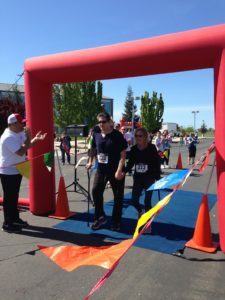 A couple of weeks ago our church put on a 5K/10K run. The most inspiring runner came in last on the 5K. Paul suffered from a stroke almost one year ago to the day of the race. But he did that entire 5K with cane in hand in 2 hours and 15 minutes. Everyone crowded around at the finish line to cheer Paul in as he slowly put one foot in front of the other, and I don’t believe there was a dry eye in the place. Paul could have said at any point on that route, “This is too hard and I’m too slow. I give up.” But he didn’t. He finished well. 1. Help them move past their stopping point. There have been times when my kids wanted to give up at something, and Jim or I simply came alongside them and finished it with them. This can be done is completing a house chore or a school project and finishing a tough physical workout. Whatever they may be facing, you walk the journey with them to give them a boost to keep moving forward. 2. You simply establish that quitting is not an option. There were times when the kids were little, they would beg us to let them be involved in some activity – dance, baseball/softball, a choir, etc. We would let them join and then before the commitment time/season was done, they’d want to quit for whatever reason – too tired, bored, not enjoying it anymore, etc. But we told them, “You made a commitment to this group/team/project and you are going to see it through.” Now we did establish that when the current commitment was completed, they didn’t have to sign up again. But they had to understand that when they signed on, they were committed to the end. And they were going to continue giving their best until they reach that point, otherwise they were going to be letting their team down and that wasn’t acceptable behavior. If you have already established a value of integrity in your home, you bring your child back to this basic value to stand on. 3. Be their loudest cheerleader. I don’t know how many times we have talked our children down off the ledge, so to speak. They have reached the end of their personal stamina and were ready to give up. We’ve seen tears, anger, indifference – all the emotions that we all can experience when we have nothing more left to give and are simply overwhelmed with the idea of moving forward. It’s in those times we tell them once again how we believe in them. We know they are not quitters, but people of integrity who want to not only finish what they started but finish well. We remind them that God gave them a good brain and strong body to complete this task. We let them know we are here for them and praying for them everyday to do whatever is ask of them and to do it well. We point out that they have done it before and did it well, and they can do it again. Hang in there – you can see the finish line. Push hard to get there. Knowing that a parent believes in them makes a huge difference in a child’s ability to persevere. Having a strong cheerleader can make you feel like you can conquer the world with one hand tied behind your back. Be that person for your children. Remind them that they can make a difference – simply keep going and finish well.